1. High speed and high precision 5 axes gantry type machining center with strong casting structure. 2. In house manufactured key components of B/C axes rotating and indexing table and high rigidity big size ring bearings. 3.Compact machine shape design brings convenient operation, easy-approach to work piece and tools bring efficient loading/ unloading. 4. Small space requirement cut down the transportation cost. It could be in container loading to save the cost up to U$ 5,000 per shipment. 5. 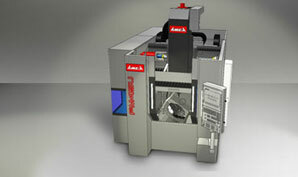 Skillful design of B/C axes rotary table – B axis rotates +180O~-160 O, max. speed 30 rpm; C axis rotates 360 O, max. speed 100rpm. Indexing table size 400x400mm, is capable for complex work piece, elongate the tool life and enhance the working efficiency. 6. B/C axes moved by high precision high torque DD motor, with in house manufactured brake system, enables 5 axes simultaneously movement and indexing at any angle for machining. 7. High speed built-in spindle and 40 tools arm type magazine (60 tools is option) save the tool changing and machining time. 8. Separated laser tool length measurement and work piece measurement are optional available.